A House panel approved a bill aiming to provide free Wi-Fi in public areas throughout the country on first reading . 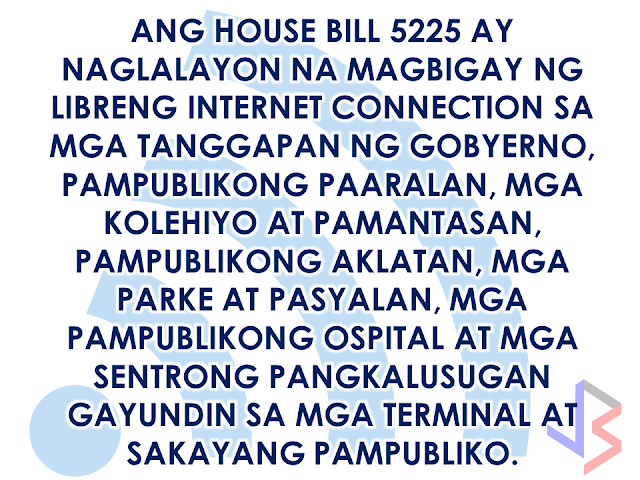 The House Committee on Information and Communications Technology (ICT) approved House Bill (HB) 5225, the “Free Public Wi-Fi Act,” in substitution of House Bills 515, 616, 1954, 1957, 2846, 3055, and 3250. "We hope to get approval [for HB 5225] ng 2nd reading next week…it is a priority bill. The president and the DICT (Department of Information and Communications Technology) have agreed to put up a backbone for this," said Tarlac 2nd District Rep. Victor Yap, chairman of the ICT committee, in an interview with ABS-CBN News. 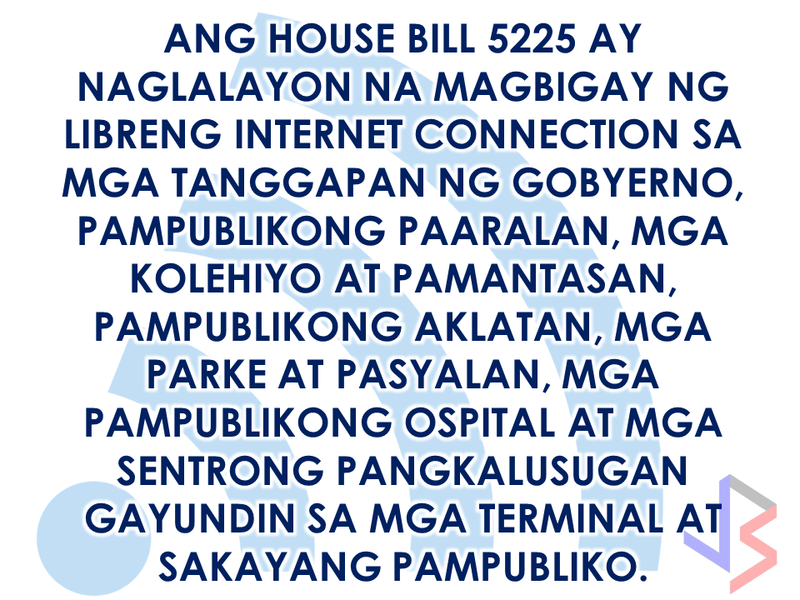 The bill aims to provide free wireless Internet connection in national government offices, public schools, state universities and colleges, public libraries, parks and plazas, barangay centers, public hospitals and rural health centers, and public transportation terminals. Wireless access points will be installed through partnerships with private Internet service providers or through the DICT. The government aims to provide an internet service with speed of 10mbps way faster that the internet service provided by the two existing telcos in the country. It is 2 years after the proposed DICT plan which was approved by President Rodrigo Duterte will finally become a law. According to Rep. Victor Yap, speed is crucial for the Internet bandwidth. Unless the speed will be at least 10 Mbps you cannot put it in good use. He also highlighted the benefits of free public Wi-Fi such as economic development, tourism, and use in information dissemination during disaster relief operations. The DICT also said that the Philippines is open for new telco players in the country. Sec Rodolfo Salalima said that an open competition in local telecommunications industry will help ensure better services and affordable pricing. The DICT is preparing a Government Portal which allows the public to have easier access to government services. The National Broadband Portal will bring internet services to the "unserved and underserved" areas of the country making government transactions fast and easy with the use of modern internet technology. The two telecom giants said that they are up to the challenge of providing faster internet connection to the Filipinos. 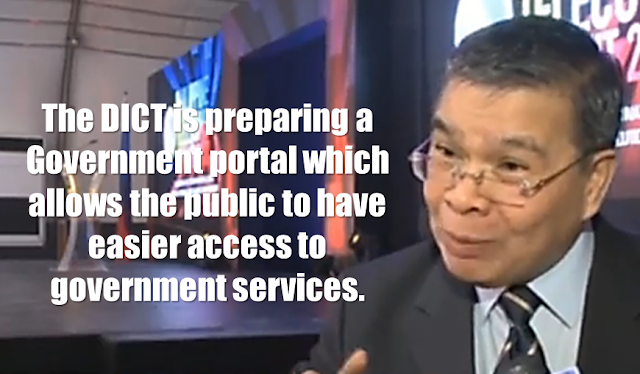 Dict is also collaborating with other government agencies such as the DILG in mitigating inefficiencies in the local government level that eventually lead to poor internet services. Salalima also said that the government has started quasi-judicial proceedings to recover all unused and unpaid frequencies. The Secretary believe that telecommunications service is a basic human right as stated in UN resolution in 2012 and the DICTs mandate is to make sure that telecommunications service is accessible to the public. The ICT Office asked for a P3.2 billion budget for this year to fund the free Wi-Fi service, more than half of the current of P5 billion total budget allocated for the agency. In the 2015 General Appropriations Act, the project had a total budget of P1.408 billion. Free Internet access and improved connection speed was one of President Rodrigo Duterte's promises in his inaugural SONA to the Filipino people.